DI Team (Sam & Jake) & Zach Win Big!!! It was a busy day on Saturday. Kari and I were with the DI team from morning to night at Buchanan High School and Zach was competing at Science Olympiad at CSU, Fresno. 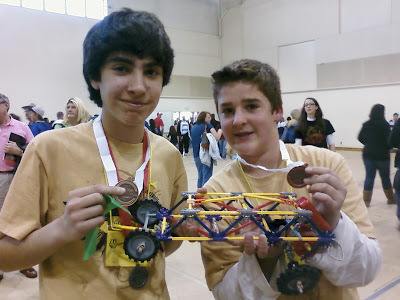 Zach also spent the day at Science Olympiad at CSU, Fresno. He competed in the areas of Herpetology and Electric Vehicle. He thought that he had done well in the Herp competition, but in the end, he and his teammate placed third from a pool of about 20 teams! His K-Nex built car competed against micro-chip infused vehicles. Sometimes technology isn't better! Here is a pic of Zach and Shad receiving their medal! Congratulations!!!! Amanda (my daughter) thought you might like to check out my 1st GIVEAWAY on my blog.... (santasgiftshoppe.blogspot.com)I'm Barbara her mom..I think I've met you a few times when I've come to things at your "compound"...I know Jennifer too.